It’s happened to most of us. You delete a file, and then realize you need it back. How to recover deleted files in windows 10？To delete files in window 10, Some people like to right-click and choose “Delete”, Some people like to select the file and press "Delete" key on the keyboard, someone like to use "Shift + Delete" button and some people keep the habit of emptying recycle bin to clear up some junk file. Fortunately, there are several ways to restore this deleted files situation. Deleted files by right-click “Delete” , select the file and press "Delete" key on the keyboard, If the file was saved on the hard drive, you can restore files from recycle bin. As long as files are not further deleted from Recycle Bin or Recycle Bin is not emptied, you are able to restore files easily in Windows. This is workable on all Windows systems like Windows 10. Step 1: Open Recycle Bin on your computer by double-clicking its icon on desktop. Step 2: Look for files and folders you want to restore and select them. You can filter files via file name, deleted time, original location, size, etc. Step 3: Right-click on selected files and choose "Restore" option and files will be restored to their original location before deletion. You can view restored files to check them have been restored properly. If you don't find the files in recycle bin,try the following. On the occasion that you cannot find deleted files in Recycle Bin, you'll have to use the backup to get deleted files back .We all know the importance of making regular backups, Cautious users always back up important data. Thus, if their data are lost caused by various reasons including mistaken data deletion, accidental partition formatting or deletion, hardware failure and so on, they can easily and quickly restore lost data from backup files. Step 1, Open “Backup and Restore” by clicking the “Start” button, clicking “Control Panel”, clicking “System and Maintenance”, and then clicking “Backup and Restore”. Step 2, Click “Restore my files”, and then follow the steps in the wizard. Previous versions, also referred as shadow copies, are copies of files or folders which are created in Windows as a part of restore point. It is another kind of backup created by Windows system. If you have such backups, you can try retrieving deleted files in this way to try your luck. Step 1, Open Windows Explorer and find the folder that contained deleted files. Step 2, Right-click on the folder and select "Restore Previous Version" option. Step 3, Now you can see a list of available previous versions. Select the version you want to restore and click Restore button. If you've tried first three Methods and still haven't been able to restore deleted data, you can try Recover Deleted Files in Windows 10 with free trial recovery software. Bitwar Data Recovery is a fast, reliable and 30-day Free Trial data recovery software with powerful functions. It is is designed to easily recover deleted, formatted or inaccessible files from Windows PC, laptop, hard drive, SSD, memory card, USB drive, SD card, digital camera, multimedia player and other storage devices. Only 3 simple steps will help you restore all lost data. How to Use the Software? 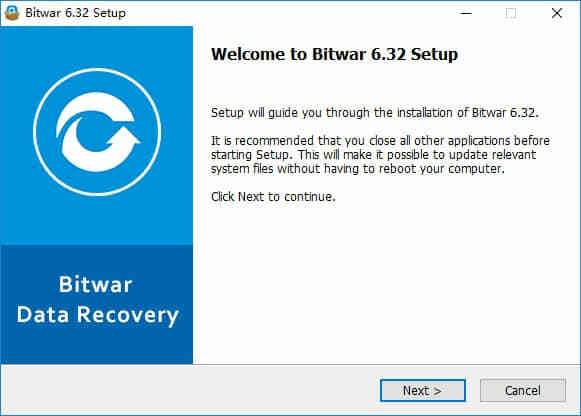 When you want to recover data from windows 10 with Bitwar Data Recovery, please stop using the partition/device where your data lost right away ,Then, download Bitwar Data Recovery to a removable disk. At last, start your computer and follow the tutorial given above to retrieve the deleted file as soon as possible. Download this data recovery software and install it on your windows on this URL :http://www.bitwar.net/data-recovery-software/. Then launch it and follow the next steps for recovering deleted files. Notes:Please DO NOT save any files/program in the partition/devices where your data lost and you want to recover from. 1. Select a data recovery mode. To recover deleted files from hard drive, you need select "Deleted Files Recovery" to start. If you want to recover deleted files from memory card, USB flash drive, digital cameras, and other devices,select “External Devices Recovery”. 2. you should select the partition/drive where you deleted your files, just as software suggests. then click "Next". Select the file types that contains deleted files and click “Next”. then the program will start scanning. While scanning, you can pause and stop the scanning processes to preview the found files you scanned out. 3. After the scan, you can preview all the listed files. Bitwar Data Recovery supports preview lost files, including common photos, Word, Excel, PDF, CAD, RAR, PSD, etc., as many as 300 different file types. When you have determined the file, select it and click the "Recover" button to save it to another partition or external device. If files are not found under "Deleted File Recovery" mode ,try deep recovery. It has deep scan can search every every sector of hard drive to find all existing files. but the scanning process will spend more time than quick scan and will not have the original file name in the scanning results. We offer 4 practical ways to help you solve the problem of Recover Deleted Files in Windows 10. If you happen to get stuck in such predicament, you may as well turn to those solutions at once. Hope you all can successfully get back your needed files that have been deleted. Summary：imagine a situation where a very crucial video is mistakenly deleted on computer by you during the course of video editing, sharing or uploading. How to find Deleted YouTube Videos?